His biggest accomplishment and favourite event to date was winning the 2011 World Curling Championships as part of Team Canada in Regina. Reid studied Kinesiology and Industrial Arts at the University of Winnipeg, and works as a school teacher. While he might appear quiet and stoic on the ice, off the ice “Reidarama” is quite chatty and outgoing. He’s also a big fan of summer sports, and says he would love to one day watch a Summer Olympic Games live in person. 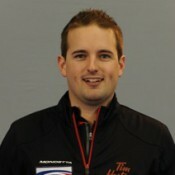 Reid skips Team Carruthers, who are currently ranked first on the CTRS. They recently earned a berth in the 2017 Olympic Trials, which will take place in December 2017. WINNIPEG SUN (Jan 31) Normally, curlers go into a big event as low-key as possible, praising the competition and spouting the usual cliches about how it’s anybody’s to win. CBC SPORTS (Jan 14) Winnipeg’s Reid Carruthers seals win with double takeout. It’s been quite some time since Team North America felt defeat. Team North America stretched its victory streak against Team World to five straight years by capturing the 2017 Continental Cup on Sunday. CURLING CANADA (Dec 4) The two ex-roommates battled it out for a lot more than just bragging rights Sunday night, and this time it was Reid Carruthers that has a lot to talk about. CBC SPORTS (Dec 1) It’s starting to become a little crowded at the top of the Canada Cup men’s standings. Reid Carruthers, 2014 Olympic champion Brad Jacobs, and Brad Gushue’s team from St. John’s, N.L., are all 3-1 through round-robin play after two days of competition at the curling tournament.